In October 2004, a team of independent filmmakers – Aisha Bain, Jen Marlowe and Adam Shapiro – left for Darfur, Sudan and eastern Chad. After monitoring the worsening political and humanitarian crisis for months and recognizing that the mainstream media offered marginal and inadequate coverage, the team set out with the goal of providing a platform for the people of Darfur (both those displaced inside Darfur and those living in refugee camps in Chad) to speak for themselves about their experiences, their fears, and their hopes for the future. The conflict serves as the ongoing narrative in the film, but the focus is on the people who are living through what has been termed a "genocide". Through the voices of refugees, displaced persons, and in particular women and children, who are always among the most vulnerable in any conflict situation, this film seeks to provide space for the marginalized victims of atrocities to speak and to engage with the world. 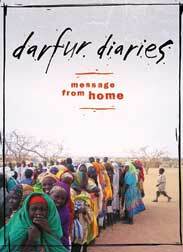 Additionally, the film probes the history, culture and heritage of Darfur as a means of deepening understanding of the crisis and complicating easily assumed perceptions by which the conflict is often portrayed (such as a matter of race, ethnicity or religion). "****An urgent call for the world community to do much more than merely observe this ever-worsening humanitarian crisis as it continues to unfold." "What is perhaps most remarkable about this film is that it dissolves the exoticism surrounding this conflict in the eyes of Westerners." "Darfur Diaries is a solid orientation to how Darfurians have reacted to the crisis, as well as a counterbalance to the Western fetishization of the region's peoples as voiceless, one-dimensional paragons of human suffering."